The following is a guest post from my friend and writer Kristen Hogrefe of ThinkTrueThoughts.com. Born and raised a Florida girl, I love the spring season best. Usually, March and April offer the perfect combination of sunshine and lower humidity. Best of all, everything sprouts green, and nature puts her finery on display. The other day, I went for a jog around the lake at my apartment complex and passed deep red hibiscus, blush pink azaleas and a coral-colored rose. Each one beautiful. Each one different. I thought to myself: That’s just how God designed them to be. Yet how often do we girls balk at our design? How often are we tempted to say, “Lord, I think you made a mistake”? We compare ourselves to one another, imagining that “the other girl” has the perfect life, the perfect view, the perfect everything compared to us. Roses have thorns. Fairy tales have flaws. The other week, I had the chance to visit one of my college friends and meet her absolutely darling baby girl. But at just over a month old, the baby doesn’t have a routine, which means my friend hasn’t slept through the night since she was born (and probably won’t for a few more weeks or months). We ate our pizza in the peaceful silence of a sleeping baby, and my friend was just thrilled that we had a whole fifteen minutes to enjoy our pepperoni bliss and garlic bread sticks before the baby woke up. Somehow, we got on the topic of how hard it can be not to compare ourselves to others, when everyone on Facebook portrays their lives to be a storybook fantasy. Perfect boyfriend. Perfect husband. Perfect baby. The last one caught me off guard. As a single girl, I understand how those of us waiting for the right guy can feel left behind when it seems like everyone else on Facebook is getting engaged, married or posting hundreds of photos from their couple’s photo session. I’m sure no one’s baby is perfect. All babies cry and spit up (which thankfully my friend’s didn’t while I was bottle feeding her). Yes, babies are a precious gift from God, but they have their less-than-frame-worthy moments. Stop thinking everyone has an ideal life but you. Even roses have thorns. Despite the profile pictures, a fairytale life is make-believe. A window garden is better than a wishing well. Did you know that azalea blooms, for all their beauty, are poisonous? It’s hard to believe that something so delicate is toxic. Yet our alluring daydreams are just as capable of poisoning our present view. After all, we can’t enjoy what we have if our heads are stuck halfway down a wishing well. In the Sermon on the Mount, Jesus warns against wasting the present. Worry and wanting go hand in hand. When we want what we don’t have, we wonder – or worry – when or if we’ll ever have the object of our desire. In doing so, we miss the blessings and beauty of today. A cultivated life is beautiful life. A rose is a rose is a rose. Right? Yes and no. There are 100 known species and thousands of cultivated varieties, according to one website. Their variations make them each exquisite and breathtaking. Instead of comparing ourselves to each other, why not cultivate and develop our own unique potential? Each of us girls is designed with a specific purpose to fulfill. Let’s stop wasting our time wishing we were someone else – or somewhere else – and brighten this world right where we are. In doing so, we can fulfill our purpose of honoring and pleasing God with our lives. Have you been playing a comparison game? How does it leave you feeling? For five minutes, write down all the gifts, abilities and blessings God’s given you. Write whatever comes to mind, no matter how small it seems. Don’t stop writing until five minutes is up. Then, thank God for everything on the list. 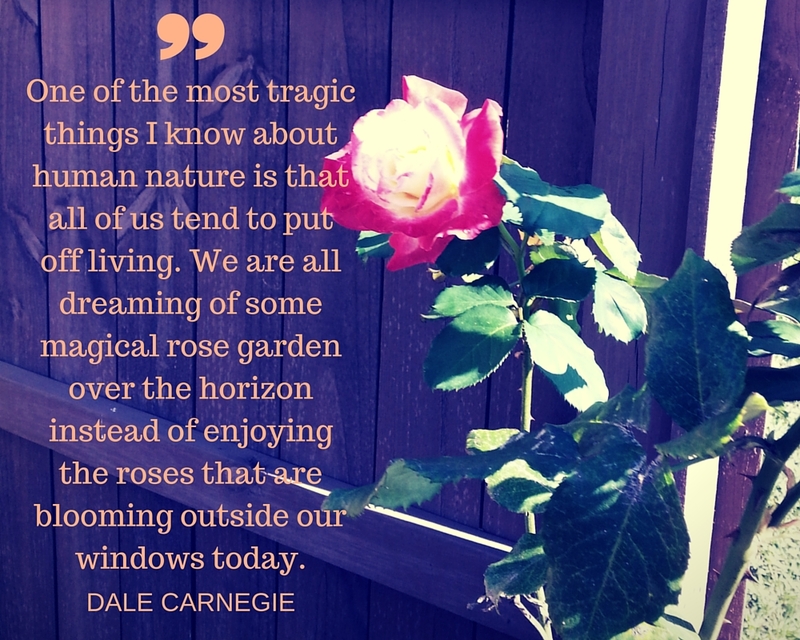 What can you start doing today to enjoy the “flowers” in your own garden? The world will be a much more beautiful place if we bloom content where God has planted us. Thank you, Ashley, for sharing my post on your beautiful blog! I hope it is a blessing and encouragement to your readers. Thank you, Ashley and Kristen, for sharing the fragrance of Christ through your beautiful writing ministries. Blessings to you both!